ADFIAP, through its consulting team, which was commissioned by the International Finance Corporation (IFC)as part of its sustainable agenda, completed its study entitled, “Risk Management Practice of Commercial Banks in Myanmar.” The study was aimed at determining the level of current practices in environmental and social risk management among commercial banks in Myanmar, including the Central Bank of Myanmar. The ADFIAP mission team initially prepared its scoping study in May and subsequently conducted in June a more in-depth quantitative and qualitative survey of ten (10) banks comprising about 85% asset size of the commercial banking sector in the country. The survey was intended to know their views on what would prompt them to institutionalize environmental and social management systems in their respective organizations. Completed in September, the results of the study was presented to the Myanmar Banks Association (MBA) on October 1, 2018 at the MBA office in No. 1 Sibin New Road, Yankin Township, Yangon. It was clear that despite the nascent development of the finance sector in Myanmar, there are already banks that see the opportunities in the green finance space. Best practices from both the South and Southeast Asia neighbors were relayed which can be replicated by Myanmar. Given the proper framework and sufficient capacity-building, more if not most of these banks will eventually be able to embrace Environmental and Social Risk Management (ESRM). A roundtable discussion followed with representatives of MBA, IFC and ADFIAP. 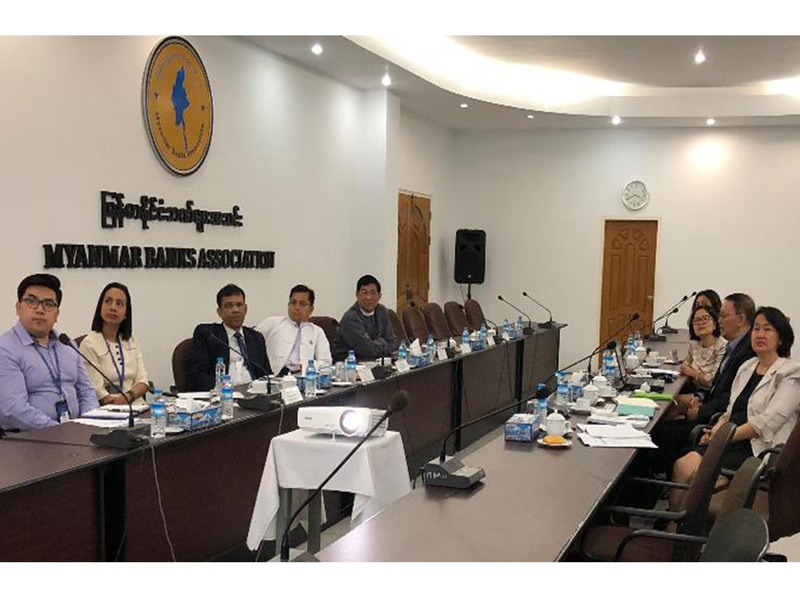 MBA was represented by its General Secretary, Aung Kyaw Myo, and Vice Chairman (3) Than Zaw and by their International Relations team and they agreed to lead the banks on the suggested next steps presented. To achieve the objectives, capacity-building was deemed to be crucial and should take top priority. It can take the mode of “train-the-trainer” model, structured training programs, or on-the-job programs. For its part, IFC has signified willingness to extend support to be able to capacitate both the banks and the regulatory agencies as well as extend easy access to information such as resources, best practices, tools, among others, and agreed to the priority activity set by MBA. ADFIAP was represented in this event by Atty. Alberto B. Reyno, Managing Director of ADFIAP Consulting, Ms. Carmelita M. Chavez, Consultant for Product Development and Research, and Mr. Aung Win Kyaw, Project National Consultant and Coordinator while IFC was represented by Ms. Huong Thien Nguyen, Operations Officer and Marinela T. Pascua, of its Environment, Social and Governance Department.